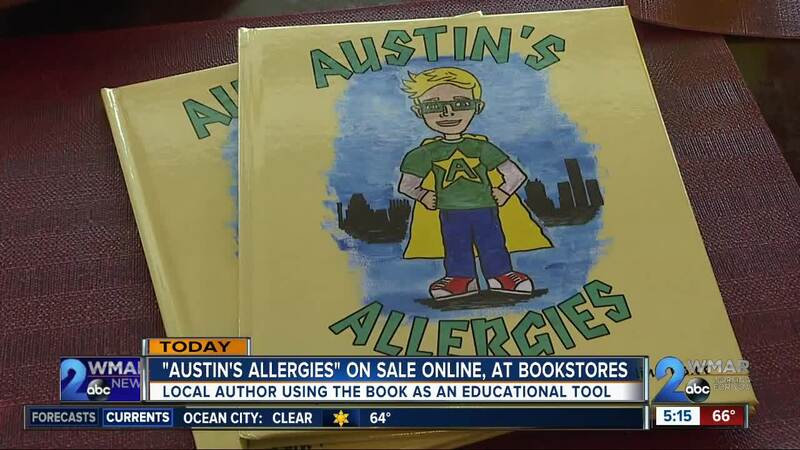 A local mom authored a book called "Austin Allergies" to teach families about food allergies. BALTIMORE COUNTY, Md. — It's breakfast time at the Mandras house. Seven-year-old Levi and two-year-old Nolan can eat whatever they want, but their five-year-old brother Austin must be extremely careful about what he eats. Austin has several life-threatening food allergies. He's allergic to wheat, eggs, milk, peanuts and tree nuts. His mom Erin Mandras says she first noticed something wasn't quite right with her son when he wouldn't take formula as a baby. He was tested for food allergies at 14 months old. "That explained why he didn't want to eat and had developed an aversion to food," she said. Austin's aversion to food was so severe, Mandras enrolled him in a six-week feeding program at Mt. Washington Pediatric Hospital to help him learn how to trust food again. Mandras says she knew life for Austin, and her, would never be the same. "For me, it was a wake up call that this was serious." Mandras says before Austin's diagnosis, she knew very little about food allergies. Now it is her and her family's world. One bite of the wrong food could send Austin into anaphylactic shock, which she says has happened a couple of times, and can be life-threatening if not treated right away. "We have to plan and prepare, look at every label," she said. "We can't go out to eat and it's a whole different life." Mandras decided to share Austin's story by writing a children's book called "Austin's Allergies." It's about the foods Austin can't eat and what he needs to do to stay safe. Mandras says the book is both an educational tool and a support tool to help kids like Austin not feel so alone. "I'm excited to share it with as many people as I possibly can to help raise awareness and educate people on a topic that I wasn't educated on," Mandras said. Food allergies have become more prevalent over the last 15 to 20 years, according to Dr. Robert Wood. He is the director of Pediatric Allergy and Immunology at Johns Hopkins Children's Center. Dr. Wood also endorsed the book "Austin's Allergies." He says five to seven percent of kids have a food allergy and that number has doubled or even tripled over the last 30 years. He says we are still a ways from finding a cure for food allergies and research is still being done as to why food allergies develop and what has caused the steady increase in cases. He says the main focus is to educate parents about how to manage their kid's food allergies. "The biggest goal is to prevent a reaction but treating it is very doable," he said. "We'd say there have been enormous advances in awareness and the ability for a family to navigate this difficult situation." Dr. Wood says Johns Hopkins is conducting and involved in more than 20 different studies looking at different treatment options for people with food allergies, such as skin patches for peanut allergies or oral immunotherapy. As research into what causes food allergies continues, Austin continues to be a happy, thriving five year old and his mom continues to share his story to raise awareness. Her goal is to get "Austin's Allergies" into every single home, school and hospital. "If I can help other people understand, as a result, more kids will be safe and more lives will be saved." You can purchase "Austin's Allergies" on Mandras' website as well as online at Barnes and Noble and Bam! Books-A-Million. It will also be sold on Amazon beginning February 19. Mandras is donating a portion of the proceeds from each book to the Allergy and Asthma Network. Mandras is also doing a book signing on March 16 at the Black Eyed Susan Coffee Candy Cream and More in Glyndon.